Mobile apps and games for an ever-evolving era! I’ve been working on some fun new concepts, trying to capitalize on a genre that is sparse these days: asymmetric coop games. I had an interesting conversation with a friend that led me to want to experiment in the genre, to capture the feeling of Mission: Impossible and other secret agent themed movies, combining action and puzzling with casual gameplay. 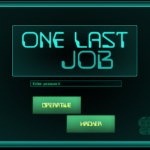 The result is “One Last Job”, a simple networked proof-of-concept that I wrote over the last few weeks specifically for GDC. The gist of the game is based on the notion of having two very distinct roles in one contracted infiltration team. One player plays in a FPS environment inside a target government agency, aided by an in-ear transmitter that connects him to his partner in crime, the hacker-in-the-van trope. 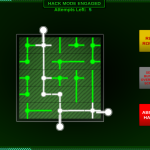 The Soldier/secret agent does not have any advanced knowledge of the layout of the mission at hand, nor the technical skill to break through defenses electronically. 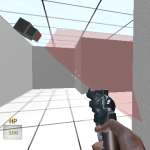 The agent can use weapons found in the map to take out opposition in the form (currently) of security cameras and defense turrets. 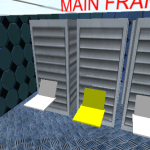 The hacker, on the other hand, has the blueprints of the facility at his disposal. Armed with knowledge, the hacker must direct the foot soldier through the facility, leading him to hackable security rooms that reveal deeper levels of security and to weapons caches. The soldier must find these rooms and navigate the facility physically, gaining access to SIPRNET-like secure networks and install hardware dongles that provide wifi access for the hacker to breach their network. This game is meant to be played in close proximity with a friend, outside the FOV of each other’s screen (laptop to laptop / laptop to desktop / mobile to desktop, etc). 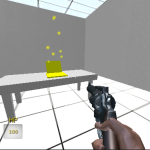 My aim is to design a game that helps satisfy veterans of first-person shooters and their friends who do not necessarily have skill or find enjoyment in the genre, but still want to provide a critical role in a game together, with casual game mechanics at their disposal for a quick and easy learning experience. The demo, like most of my work thus far, has been written in the magnificent Unity 4. 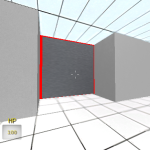 To jump ahead, I used the FPS Component plugin from the asset store, modified to suit the needs of the game. 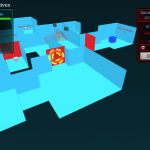 In addition, networking is supplied by the Photon Network plugin, which provides cloud-based multiplayer support which lends itself to incredible flexibility in terms of game form factor. For this demo, the game is written as web browser client which makes it easier for me to share with other folks during the conference. Unfortunately, I have to hide the game behind a password to prevent a large demand of network traffic through the Photon Network, which is cloud-based and thus limited to the number of clients it can support in a free capacity. If you’d like to check this game out, let me know and I’d be happy to run it through with you or find someone to do so (fresh perspectives make the experience really shine)! Enjoy these screenshots!